The gap of consciousness, knowledge, and awareness between those that genuinely seek truth and those who blindly believe what they are told by government and mainstream media without challenging the information, is at an all-time high and getting worse. The widening differences between truth seekers and those who are hypnotized in the matrix of lies and mass media fed government propaganda, is greater than its ever been. Though I have no way of measuring this, I can't image we have ever seen such a wide gap in consciousness amongst people living in the same era, sharing the same general standards of living and technology. No, I'm not talking about merely differences in points of views, opinions, and personalities. And I'm not talking about differences in class or economic status. I'm talking about a wide gap of consciousness and enlightenment about the reality of our world that is manifesting within humanity today. My point is based on the fundamental principle that "government" (and all its mouthpieces, as it exists today) is fundamentally opposed to truth. In the presence of truth, government (as we know it) cannot exist unless it is transparent and truly reflects the will of the people. This concept of a true transparent 'Republic' reflecting the will of the people is so far from the current model we live in now that it is laughed at by many today and is considered a near utopian, primitive, outdated idea. This idea often described by Liberals as utopia and outdated is however at the root of our very own Constitution. These widely different views of the world are also typical of a society divided against itself and is largely reflected in the use of words. One must first understand that there is such a thing as a widening gap of knowledge and consciousness. This mental and spiritual energy difference and wide manifestation of human consciousness is undeniable and its tension can now be cut with a knife. Don't believe it? Listen in on conversations between genuine truth seekers and their polar opposites, those that believe mainstream media lies. Between truthers/critical thinkers and their intellectual, spiritual and fundamental opposites- the hypnotized masses- those deeply mentally enslaved in the matrix of lies- the makings of a large consciousness gap exists and their use of words gives them away. Most people whether they realize it or not, belong to one of these groups. How can you tell the difference? Listen to the words that regularly come out of your mouth. Truth language, based on knowledge and understanding of factual events of the present and past, versus conditioned and engineered language and perceptions entirely engineered by government, is what we are talking about. Throughout history, the meanings of words, grammar and language have played a key role in defining the journey of humanity. Humans use words to communicate, and words have power and important meanings. Great contrasts in word usage can thus be used as a gauge to determine the level of conflict in a generation. This is true today as much as in any other time in history. That said, here are 10 key terms that for the most part are completely nonexistent in the minds of the average unassuming blind sheep whose entire paradigms are engineered by government propaganda. Meaning that for the most part, if you even mention the term to these people, they will give you a confused look as if they've never even heard the term before. Many truth seekers themselves fail to realize that what is common knowledge to you is completely alien to these consciously debilitated and mentally enslaved brainwashed sheep. Here are some of the terms that make for a great vocabulary litmus test which you can use to test the brainwashed sheep in your life. 1- Controlled opposition - As simple as it may sound. Most sheep have never thought about this concept because it is often related to corrupt controlling governments, specifically the U.S. government and its (Intelligence) strategies for infiltrating and controlling political movements whose purpose is to expose government at some level. The strategy of controlled opposition, so alien to brainwashed sheep, is thus employed by often placing individuals in leadership positions of groups whose purpose involves some sort of activism. Since those that are asleep in the matrix don't ever consider the concept of oppressive government unless they are reading about ANOTHER government, they think while it can happen to other countries, it would never happen to us here in the U.S.. Thus this concept is entirely foreign to them. 2- False flag - False who? That is the likely reaction you will get from those who are still asleep in the matrix of lies. (pardon the constant reference to 'matrix' but it really is bests described as a matrix of lies). Clueless to what a false flag is even dedicated activists who are otherwise still asleep in the matrix of lies will protest wars never even considering that the war they are protesting about was started by a false flag event like Vietnam or Afghanistan. Watch the look of confusion and disorientation as you explain to a sheep that a false flag is simply creating a catastrophic event or attack of some kind, then simply blaming it on an enemy that you wish to attack. The meaning is so simple. It's one of the oldest military tricks in the book, yet sadly today, given our wide gap in consciousness and knowledge, many have no clue what a false flag means. 3- Fractional reserve banking - Fractional what? Yes, that will be the typical response from someone completely asleep who is not by chance an economy expert or banking professional. I'm talking about your average sheep. They will have no idea that this is the master scheme employed by the western banking system to create money out of thin air. The entire scheme of how money is created by the private Federal Reserve and the entire western-global banking system of today is for the most part completely unknown to the masses. Few if any sheep realize that banks can lend out ten times the (pretend) money (which they don't have) for every single loan they create that gets transferred to a receiving account. None of them realize that these banks then turn around and charge interest on this very money they never had to begin with. The receiving account in this example is the bank of the person or company who sold the item to the buyer (ie car dealer etc). This ability to perpetually create money and thus real debt for which they will ruin people's lives if not paid back, may be quietly one of the great human slavery tools of our times and a concept far too overwhelming for the average person to wrap their heads around. 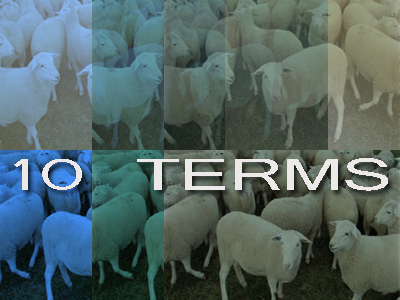 4- Geoengineering - Good luck finding sheep who have heard this word or know what it is. Few if any of the brainwashed masses have been able to wrap this concept around their heads. The idea that scientists here in the U.S., (many who are likely carryovers from Project Paperclip) are actively experimenting genetically and microscopically, to manipulate nature and play god on behalf of government and mega-corporations. From chemtrails spraying of chemicals in our skies to manipulate the climate to tampering with our food and replacing natural food with genetically modified organism, geoengineering is sadly and shockingly to the large masses, still an unknown word. 5- Compartmentalization of knowledge - This is exactly how the U.S. military manages to fool soldiers into believing their mission is noble and worth dying for. Understanding this one powerful and deceptive technique would unlock a sea of knowledge for anyone who wants to learn how military does what they do. It describes how military orders are trickled down the chain of command on a "need to know" bases. And it explains how important it is that knowledge about the true nature of a mission is revealed only to the very few at the top, while others below are told only what they need to be told in order to carry out the mission. In other words, compartmentalization of knowledge is a fancy term to explain how they lie to military soldiers to ensure the mission carries out. With all the wars today, you would think this phrase would be common knowledge especially within our military, but apparently knowledge about the concept of 'compartmentalization of knowledge' is itself compartmentalized so the sheep can't ever connect the dots and are thus easily controlled. 6- Cognitive dissonance- Another phrase that most brainwashed sheep will never think of, or ever for a minute consider they are experiencing themselves. If you find a brainwashed mainstream media believing sheep who has even heard this term before rest assured they will never have considered that they are experiencing this disorder themselves. Like an invisible enemy 'Cognitive dissonance' looms in the background of every piece of truth that the sheep hear. And that is the unsettling feeling, the mental contradiction that arises when information you hear, while it may appeal to your common sense and reason, conflicts with the belief system and paradigm you are committed to. Faced with the decision to accept or reject, this information is then rejected leaving the person with an awkward feeling or anxiety referred to as cognitive dissonance. Sadly most brainwashed sheep are completely unaware of this term much less have considered confronting their own cognitive dissonance about the new world order and the lies we are told daily by the mainstream media and government. 7- Agenda 21- Test your zombie friends out for yourself. Ask them, have you heard of Agenda 21? Then watch their reaction. Very few know of or have ever heard of the U.N.'s Agenda 21. They simply have no idea what it is. Again, these are terms that truth seekers take for granted and they forget how ignorant most people are of these programs and terms. Much less will they know that Agenda 21 is the global blueprint for enslavement, monitoring, control, and taxation of all of humanity globally under the guise of "sustainable" living. 8- Nano-thermite- Even 13+ years after the globalist terror attacks of 9/11 and years after 3 teams of independent scientists discovered nano-thermite in the dust samples of the World Trade Center proving controlled demolition of all 3 towers once and for all, the blind mainstream media (and Popular Mechanics) believing zombies have no clue what nano-thermite is. They have no idea it's been used for controlled demolition at least as early as the mid 1930's in Germany (Reichstag dome), or that together with cutter charge technology (which is patented) nano-thermite is a great tool for large-scale military style controlled demolition, like the kind we saw on 9/11. Despite all of this knowledge easily and freely available to the general public, most blind sheep will look at you like you are a crazy conspiracy theorist as soon as you say nano-thermite. 9- GMO- Even with labeling becoming more common, especially amongst food companies whose products are GMO-free (non-GMO), the masses for the most part still have no idea that most of what they eat is genetically modified and has been altered by Genetically Modified Organism. Forget understanding what makes a food item genetically modified, we're just talking about the term itself. Sadly, most of the brainwashed sheep who reject and ignore knowledge about GMO's (and other genetically related alterations of nature) are the same ones mostly consuming GMO foods. It is highly likely that cancer rates amongst brainwashed (mainstream media believing) sheep is likely to be much higher than it is amongst truth seekers who are often committed to eating healthy and completely avoiding GMOs. I'd be very interested in seeing a poll comparing the health status of two groups- those that have never heard of GMO and those who have. 10- Orwellian- Finally, the term 'Orwellian' comes from the George Orwell novel '1984' where Orwell depicts a society so brainwashed by government propaganda that it literally flips the value of what is good and what is evil to its exact opposite, just as we see today. Ask an un-awakened sheep about who said 'war is peace', 'Freedom is slavery', 'ignorance is strength' or what any of this means. Ask them if they know what is an Orwellian society, but don't expect them to know. Don't expect them to see that '1984' is frighteningly similar to today's America. Today, as we have seen throughout human history, words have become the very thing that separates truth seekers and blind sheep. Government has not only created its own words to use as a weapon (ie "conspiracy theorists"), but it has also created an unreachable threshold to isolate the minds of those controlled by mainstream media-government propaganda. As a result of this mental isolation, terms that are otherwise now common knowledge to anyone who opens their minds to truth and thinks critically, are completely unheard of by these poor mass mind control subjects. Let us not take for granted the power of words and how words can be used to widen the gap of consciousness and thus push the masses into deeper and deeper unawareness. One solution for this widening consciousness and awareness (or lack thereof) is to keep sharing the information with as many people as you can. Let's consider that though this widening gap of consciousness exists between truth seekers and sheep followers, so does the growing numbers of people that are waking up. Ultimately, truth is slowly winning and will prevail. Let us keep exposing the deceivers, share articles like this and help bring more awareness and awakening until we see a critical mass effect. Till then, simply sharing these terms and concepts and helping others become more aware of them will help us break through some of the denial and narrow the knowledge gap that exists.